There are tons of themed energy drinks in the market - some with lightning bolts and some with muscled graphics but this appeals to me most and they have a cool website too! Anybody can help me with finding out who is behind this design? More on the product - Wiki. Battery is a caffeine containing energy drink. Its effect is based on coffee and guarana extract as well as taurine. 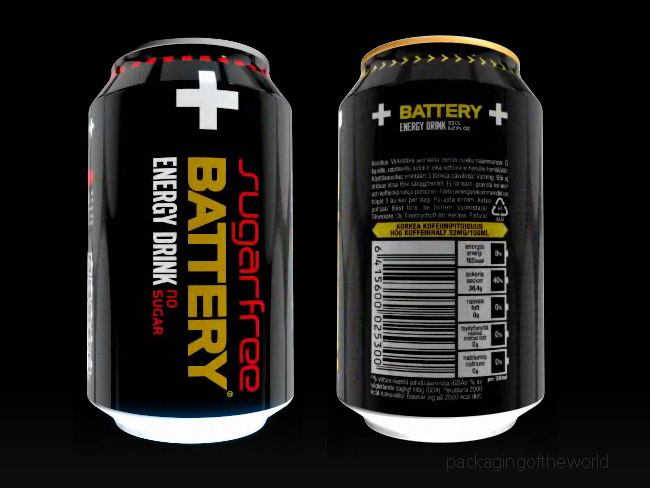 The original Battery Energy Drink currently has three variants: Battery Juiced with whole orange juice, Battery Gingered with ginger flavor and the sugar-free Battery Stripped (known as Battery Sugarfree in some markets). Battery is owned and manufactured by Finland's Oy Sinebrychoff Ab, a part of the Carlsberg Breweries A/S group. Battery was introduced in Finland in 1997 and is currently available in about 35 countries on six continents. 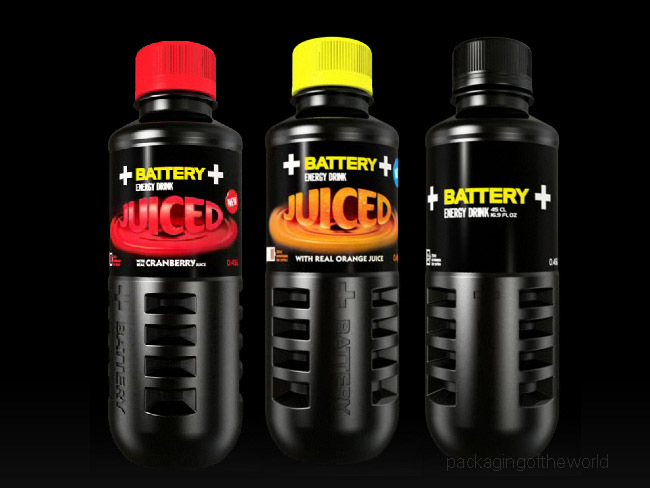 Battery is the leader of Finland's energy drink market. Battery's slogan is Keeps You Going. Battery has been an official sponsor of the AT&T WilliamsF1 Team from 2006 till 2008. Battery has sponsored the early careers of Formula One drivers Nico Rosberg and Kimi Räikkönen as well as rally driver Tommi Mäkinen and freestyle skier Janne Lahtela among others. This is so appealing to me too! The design of the 2 variants of Battery Juiced have been realised by CB'a Design Solutions. Ehmmm. Right. The creation of the Battery packaging is from Finland. Also the bottles. CB- was only in process of making it work in the can printing. Nope. Made in Finland. You can contact www.sinebrychoff.fi to find out more!